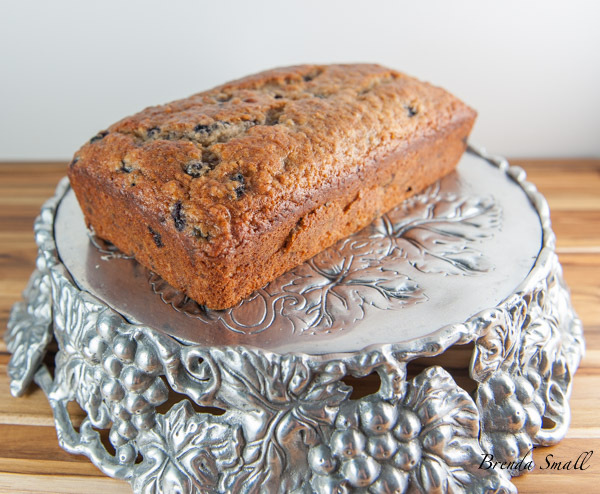 I have a feeling this sweet bread recipe will become a regular in your kitchen. It’s been a hit every time I’ve made it. 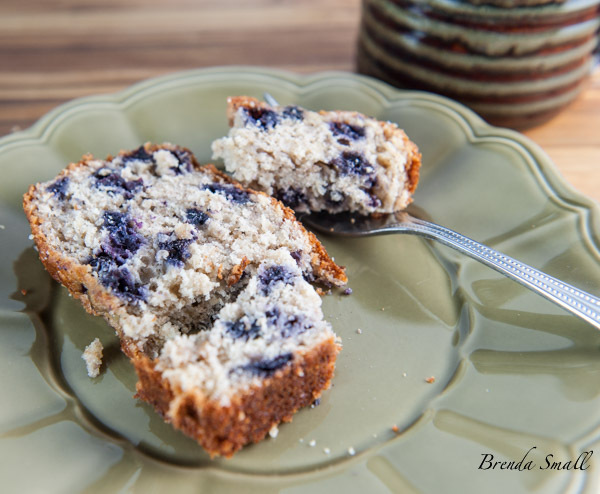 As Joel loves to snack on blueberries on his way to work in the mornings, I always have a stock of blueberries in my fridge, and I always seem to have ripe bananas hanging around; so this recipe is a natural. I’ve been entertaining as long as I can remember, and I love it! I guess you could say, “It’s one of my things.” To me, entertaining has always been a gift of love from my kitchen! I have a system for planning and organizing. First, I am big on notebooks. I have a lot of 4 inch notebooks full of recipes catagorized “To Try”, “Posted in Blog”, “Working in Blog”, “Party Planning”, etc…You get the picture?? 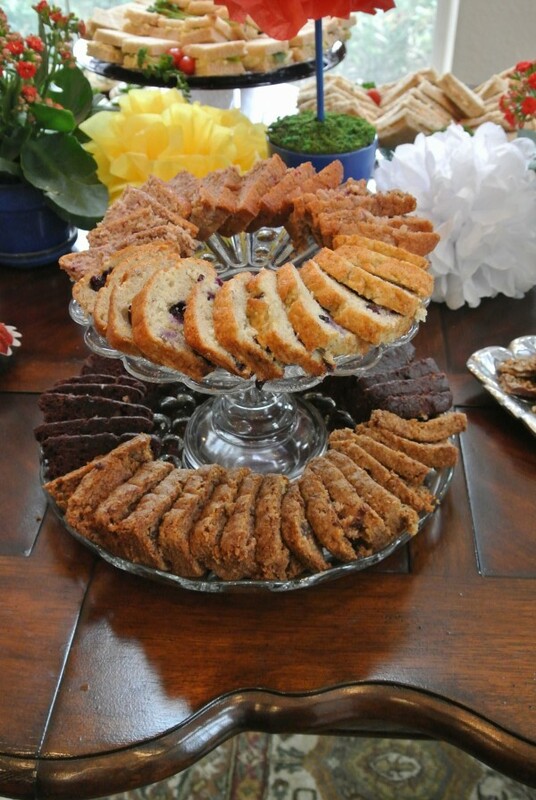 When I’m planning an event or just having friends over for dinner, I start going through my recipes and organizing the ones I might want to try in my “Party Planning” notebook by catagories… “Appetizers, Soups, Salads, Entrees, Sides, Breads and Desserts”. Closer to party time, I narrow it down to far more recipes than I actually need, but I always have such a hard time deciding which ones to make. I also use an app called Evernote for the my planning. It is a great organizing app, plus it archives my entertaining. (God forbid I should ever serve a dish to a guest twice!) It lists the event, the date, the attendees and the possible recipes I might make with all of the ingredients I would need to prepare each recipe. A couple of days before the event, I make a grocery store and Costco run to purchase all of the groceries I could possibly need. I try to prepare a few of the recipes on my list the day before the event. The day of the event, I set the table, get all of my serving pieces out (I put a label in each serving dish stating what recipe goes in each dish.) and then I start cooking. Whatever is cooked when my back wears out, that is what I serve! And that, my friends, is the “Brenda Small Method for Entertaining”! 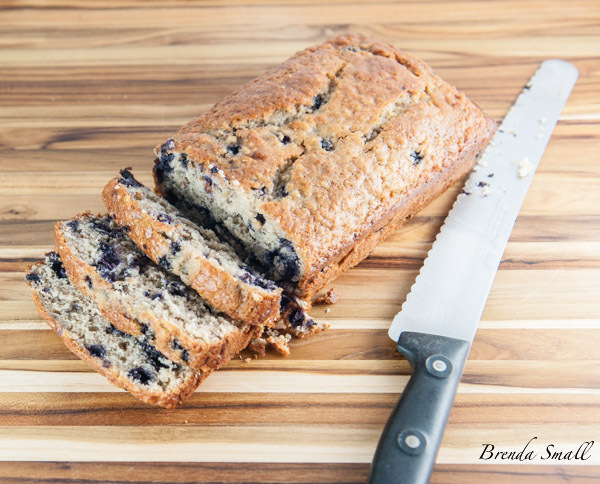 Now that I have overwhelmed you with entertaining information, back to the Banana Blueberry Bread. 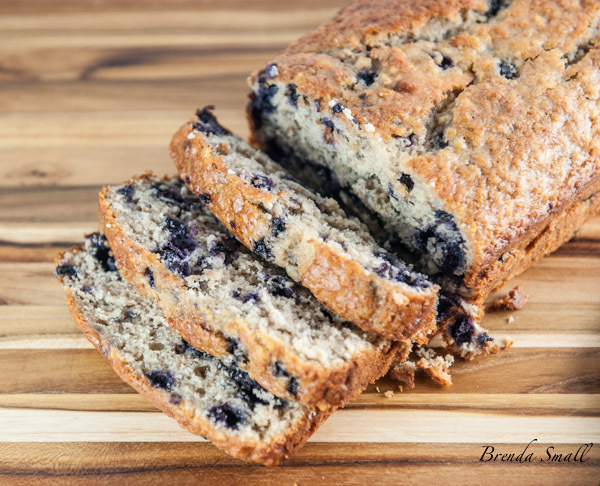 To prepare the Banana Blueberry Bread, you will need: all-purpose flour, whole wheat flour, granulated sugar, baking powder, sea or Kosher salt, quick-cooking oats, eggs, Canola Oil, bananas and blueberries. As Joel and I both turn 65 this year, I have put a lot more thought into the foods we eat. It has been in the back of my mind for years, but when Abby introduced me to The Food Babe blog, it totally changed the way I think about the food I serve. 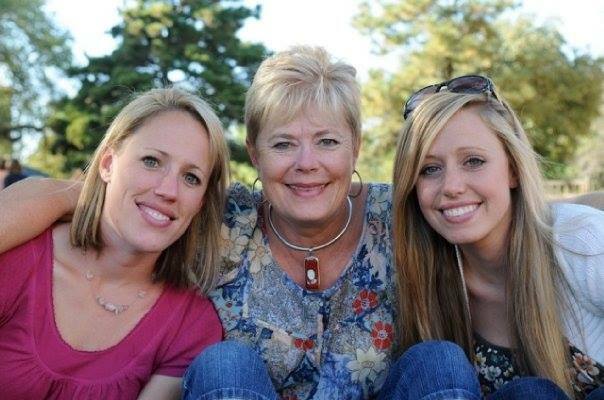 The focus of her blog is exposing the dangerous additives in our food supply. (Do yourself a favor and check it out.) This country allows many dangerous food additives that are banned in Europe. Imagine that! One of Joel’s partners at North Texas Endodontic Associates is from Ireland, and was amazed at the nasty things that are allowed in our food! Disgusting!!!! As a result of all of my research, I try to read and understand labels and purchase as much organic as I can. In the future, I will be passing information along and you can decide for yourself what is relevant for your family. I will also be putting some of the articles on my Facebook page. 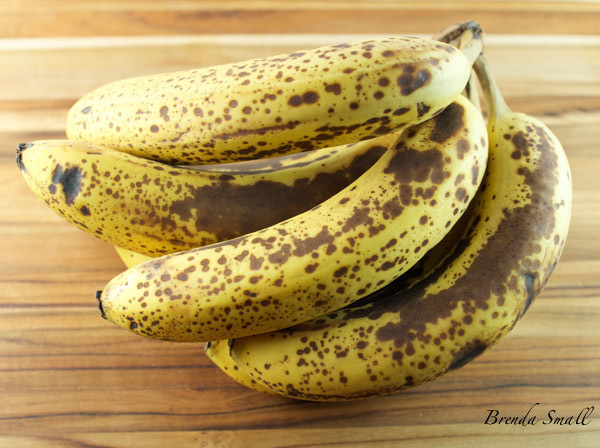 This is what bananas that are perfectly ripe to bake with should look like. These are the frozen, wild blueberries I purchase at Costco when the fresh, organic ones are not available. Be sure to leave them frozen (The frozen ones are a little mushy when thawed.) for use in most recipes so you don’t end up with a totally purple batter. Also, I use them for Joel’s breakfast smoothies, along with frozen strawberries, bananas and mangoes so I don’t have to add so much ice. 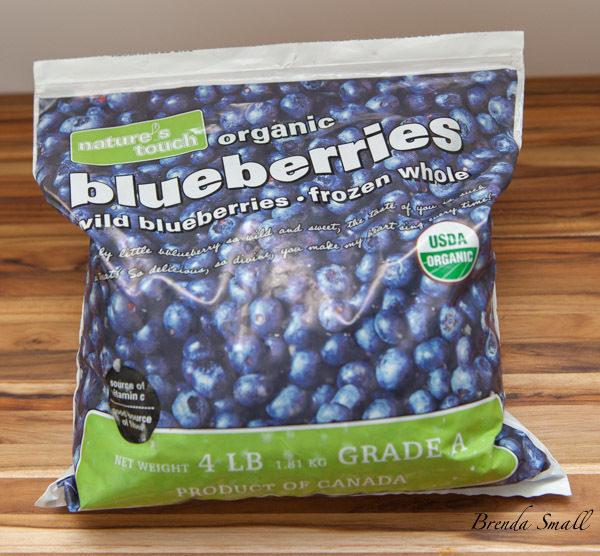 Be sure to carefully fold in the frozen or fresh blueberries. 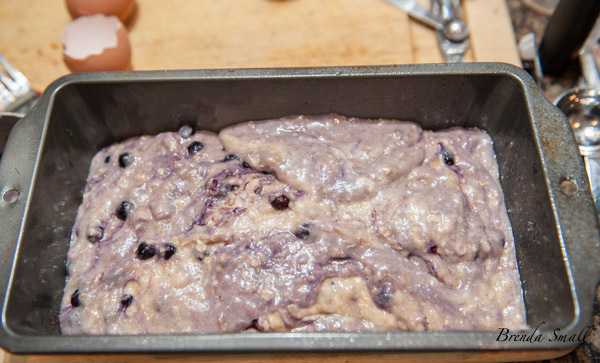 You will get a small amount of purple in the batter, but as you can see from the following photo, the baked bread is not purple. This is what the finished Banana Blueberry Bread should look like. It is very moist, with a great texture. Not too crumbly. As an aside, I prefer using a serrated knife for slicing breads and cakes. I get a much cleaner slice. Preheat the oven to 350F. If you are using a dark colored pan, lower the oven temperature to 325F. 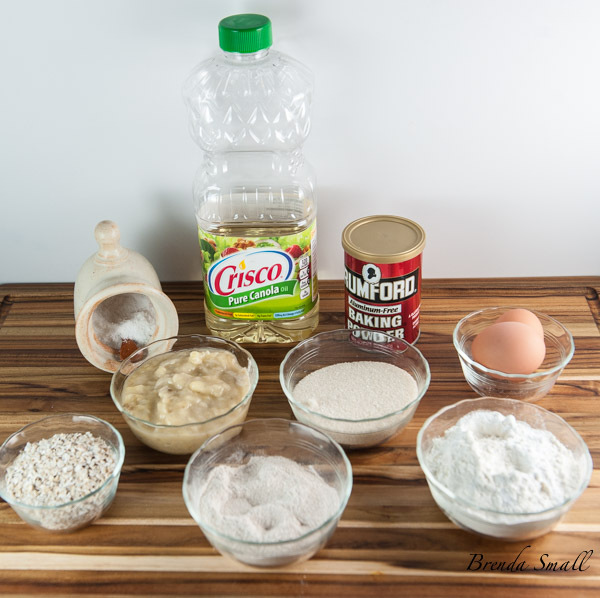 In a medium sized mixing bowl, using a wooden spoon, combine the flours, sugar, baking powder and salt. 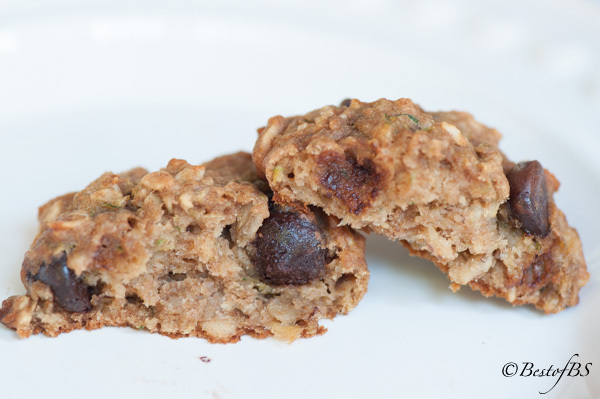 Stir the beaten eggs, Canola oil and bananas into the dry ingredients and mix until combined. Carefully fold the blueberries into the batter. Bake about 1 hour. DO NOT OVER BAKE. Check at 50 minutes by sticking a toothpick into the center of the loaf. When it's done, the toothpick will come out with just a few moist crumbs clinging to it. You may have to bake it up to 1 hour and 10 minutes. Cool in the pan for about 5 minutes. A cinnamon crumb topping distinguishes this wholesome banana bread made extra flavorful with quick cooking oats, brown sugar, and vanilla extract.